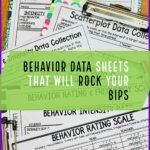 The last few posts I have focused on Structured Work Systems and how to design tasks for them. 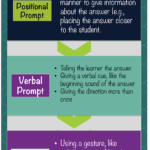 In the next few postsI thought I would share some additional examples of work tasks. 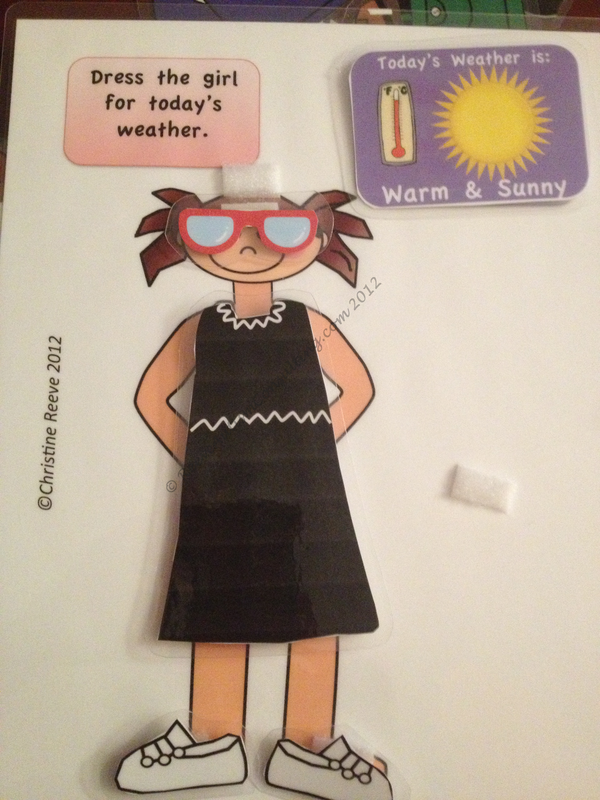 The first is a set of file folders working on dressing to match the weather. Weather Kids is a task that can be used in several different ways. 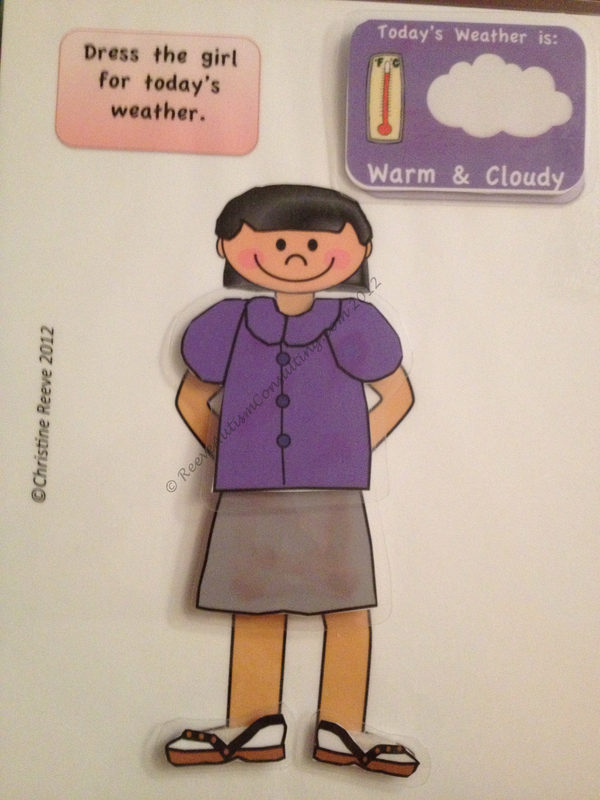 The teacher can choose the weather and the student can dress the figure appropriately for the weather, choosing from an assortment of clothing and accessories. 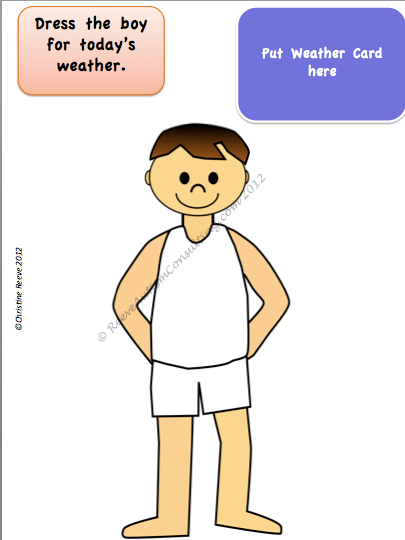 Or, for students who are also learning to determine the weather through looking it up online or in the paper or news show, the student could also choose the icon representing today’s weather and dress the figure accordingly. There are 3 sets of tasks: Weather Chick, Weather Guy, and Weather Kids that has both boys and girls. 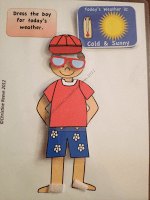 If a student has not mastered dressing for the weather, the task can be used as part of a morning routine or activity. 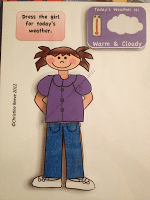 Typically in classrooms for elementary-aged students with special needs or early elementary grades, there is a morning meeting or circle time that includes a weather component. 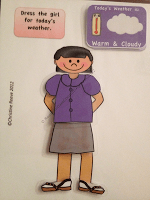 Often students check the weather and report back to the group and typically there is a weather helper or two who practice this skill each day. Consequently students get practice about once every 20 or so days. 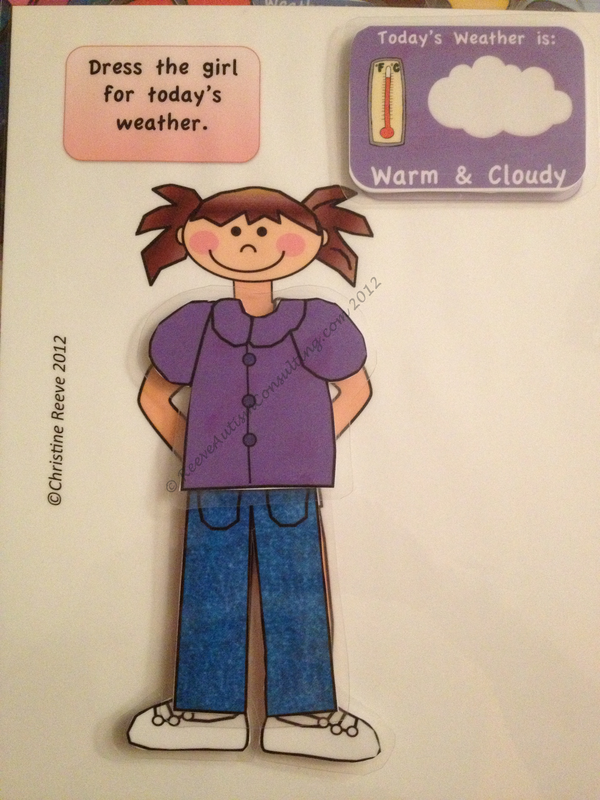 The Weather Kids activities can be made into file folders so that each student could have his or her own character to dress while the weather helper does the one on the board or interactive white board. This means that each student would practice the skill each day. 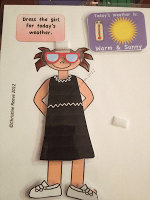 When the student has mastered dressing for the weather, the file folder can be put in his or her structured work system. Because the weather changes daily, although less so in Florida than in some other states I must admit, the task is new each day. This means that the file folder can be used repeatedly throughout the year. As the teacher, you can set up the folder so that it only contains the clothes needed to dress the figure or so the student has to make choices between 2 or 3 alternatives. There are girl figures with different hairs and skin tones. 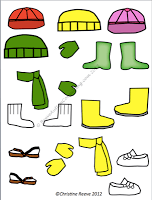 There is clothing for different types of weather including jackets and shoes. 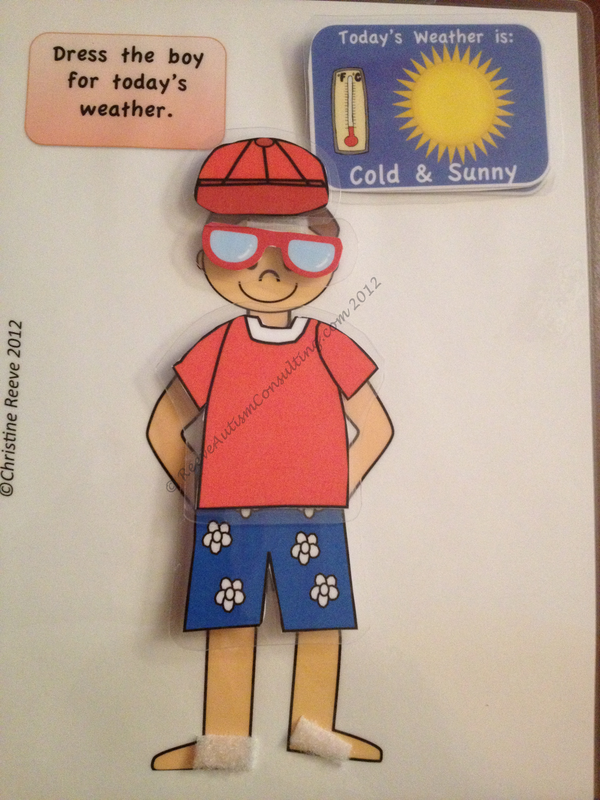 Both the the boys and girls also have accessories (sunglasses, umbrellas, and snow shovels). 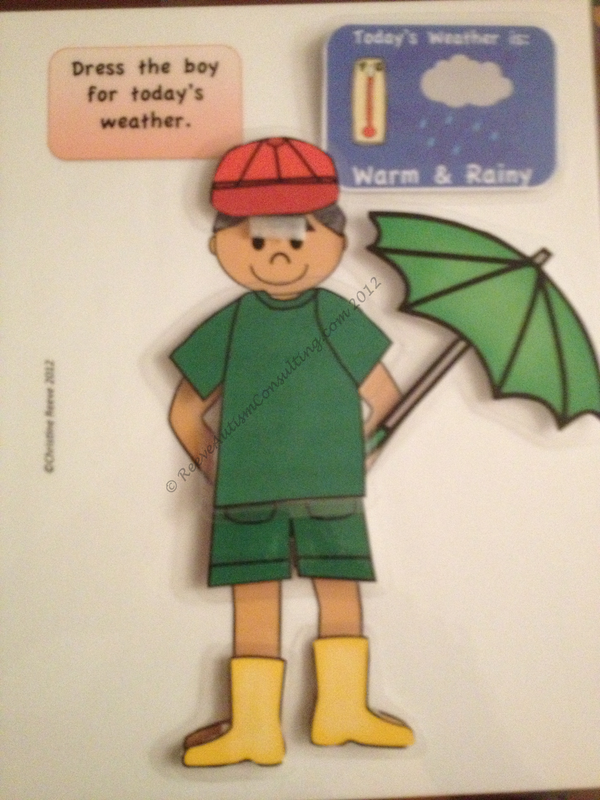 The weather card in the upper right corner is designed to be changed out to 8 different combinations of warm/cold and cloudy/sunny/rainy. So it can be cold and cloudy or warm and raining. 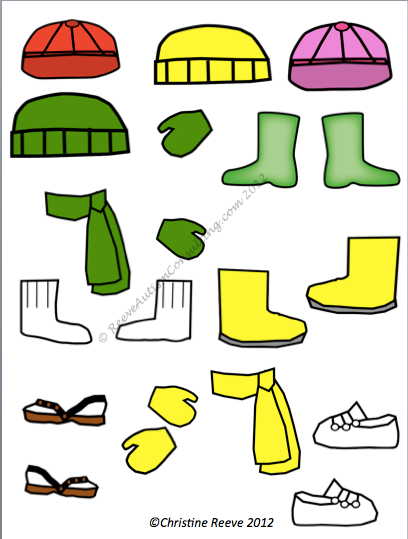 There are snow boots and rain boots, along with scarfs, socks, hats, mittens, and sandals. 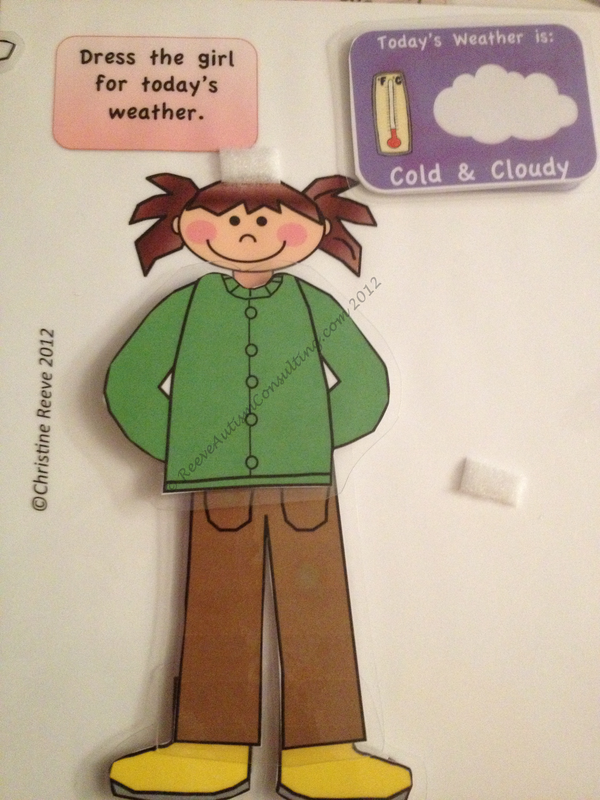 The activity also comes with labels for the file of Weather Guy and Weather Chick and graphics for the front of the folder itself. 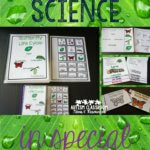 Each file folder is set up to have the pieces in the file folder and you can choose to put the figure on the outside of the folder, the inside of the folder or in a separate piece of laminated card stock that is stored within the file folder while the pieces are stored on the folder itself. This set of tasks meet all the criteria discussed in the previous post for work systems in that it is visually clear and has a clear beginning and end. 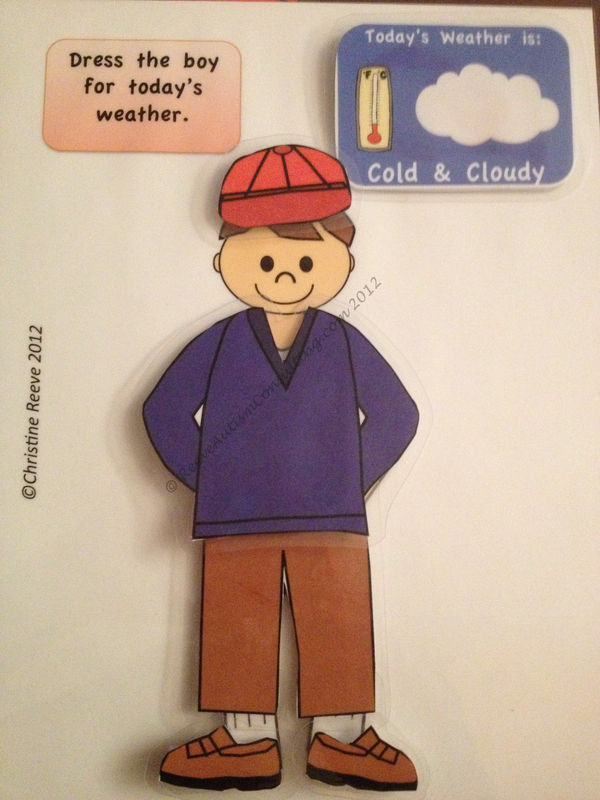 You can purchase Weather Kids for $4 or just Weather Guy and Weather Chick (each $2.50) through my Teachers Pay Teachers store. 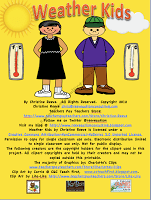 There is a free preview that you can download that shows all the different pieces. 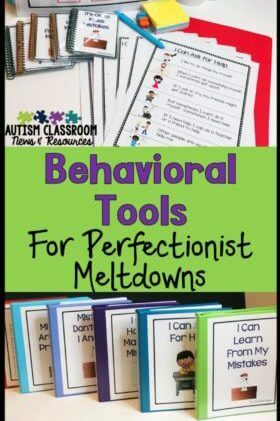 I have found them to be helpful in planning morning meeting times as well as for work systems. I hope you will too. For more ideas about tasks, check out my Pinterest page specifically devoted to work tasks that I’ve discovered on the web. 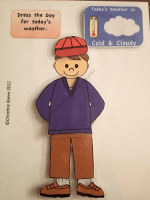 This particular task is appropriate for children in elementary school. Ideas for tasks for older students can be found in our book Building Independence: How to Create and Use Structured Work Systems. 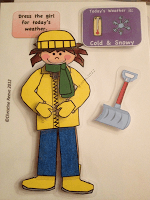 If you have ideas for work tasks or for ways to teach the weather from your classroom, please share them in the comments!